Millions of people across the country have stretch marks. Historically, there have been very few options for stretch mark removal, and many over-the-counter products on the market now are ineffective for most people. Although stretch marks will likely never disappear completely, there is one treatment that can create healthy new tissue and accelerate the skin’s natural healing process. While stretch marks aren’t exclusive to one gender, they are more common in women, especially during pregnancy. A combination of the skin attempting to stretch quickly and surging hormones, which weaken skin fibers, cause stretch marks. During puberty, children may get stretch marks as their bodies grow quickly or they gain weight. Luckily, childhood marks are normal and may fade with age. From creams to surgeries, there are a lot of potential stretch mark treatments available today. Unfortunately for consumers and patients, there is little evidence that some of these products work. Tretinoin is a retinoid which may help fade newer stretch marks and treat wrinkles. For some consumers, however, creams containing tretinoin could cause reddening, irritation or scaling of the skin. According to one study, women who massaged bitter almond oil into the skin on their stomachs while they were pregnant had fewer stretch marks than those who used oil but no massage. Natural creams including cocoa and shea butters, olive oil and vitamin E may help skin feel softer, but their efficacy in reducing or preventing stretch marks has yet to be determined. Some believe this herbal oil encourages cells in your body to build up skin tissue and support collagen production. Although it’s in several over-the-counter skin creams for stretch marks, there’s little evidence that this oil lessens their prominence. Because collagen is the protein that gives your skin its elasticity, some people turn to collagen boosters to increase its concentration in the skin. However, there’s no way to tell if the collagen treatments will fade or prevent the marks. During procedures such as a tummy tuck, surgeons may remove skin with stretch marks, but these operations typically leave scars, are painful, and costly. In one study, researchers found that in most cases, patients who received microdermabrasion showed mild to moderate improvement. The most commonly observed changes were decreased hyper pigmentation of the skin and an increased signs of skin recovery from stretch marks. Patients receive a targeted blast of light on new, red stretch marks. The theory is the light’s energy can calm blood vessels under your skin that could cause the marks. What Is the Most Effective Way to Remove Stretch Marks? Laser stretch mark reduction is by far the most effective method for stretch mark removal. During treatment, a trained cosmetic professional removes the thin layers of skin surrounding the stretch marks using a high-energy ultraviolet laser. This light disrupts the molecular bonds in skin tissue, causing them to disintegrate. Once complete, the treated area will heal quickly, followed by growth of new, healthy skin. 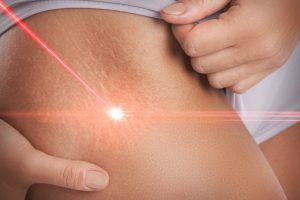 If you’re considering whether laser stretch mark reduction is the right procedure for you, stop by Virginia Surgical Arts for a consultation with Dr. Sergio Vendetti. Dr. Vendetti is currently the only practitioner in the South Hampton Roads area using the Palomar Starlux 1540 system – one of the only laser devices approved by the Food and Drug Administration (FDA) to successfully treat stretch marks. Schedule your consultation online today or give us a call at (757) 430-7690.